I carry a journal with me, always. Especially in Mexico. We drove out of Ciudad Oaxaca in an old Nissan pickup with no seat belts: myself, another American, and three Mexican teachers intent on providing reading material for indigenous students. The state of Oaxaca speaks at least fifteen languages. Like the children of minorities in the United States, indigenous kids start school handicapped by an ignorance of the language of instruction—in this case, Spanish. The schools had made little provision for them, and their teachers had begun to make one-off picture books for them in Zapotec, Mixe-Zoquean, Chocholteco. I’d been invited to Oaxaca to observe in a few schools—that’s what the truck trip was about—and later, when we got back to the capital, to give a workshop in grassroots picture book design. At the teachers’ meeting I’d held up my journal and explained, in my own unreliable Spanish, that I always take notes—in Spanish, fichas—as I go along. They looked alarmed. Well, my own mother had been alarmed at her daughter’s choice of profession. Five of us squashed into the little truck and climbed out of the cactus flats of the dry interior into the Sierras, on a highway called a highway only because everything else was dirt. We switchbacked through darkening pines, passed women hauling firewood with hempen tump lines, and crested the high, piney ridge just at dusk. Looked east. Stopped the truck. Beneath us an ocean of cloud rolled to the horizon, vast and shadowy and blue with night. The world had sunk away, and only this endless sea was left: dim, chill, perfectly still except, deep within it, the echoing calls of monkeys and some unknown bird. “My journal….” It was in my pack, stuffed in a cloth duffel. I yanked out of the duffel…not the journal, but a pair of pink bikini briefs. Mi jaula de changos. I wrote it down. I take notes, it’s what writers do. The teacherage in Santa María Tiltepec was a clutch of adobe shacks, patchily lined with plastic sheeting. From the kitchen ceiling hung one bare light bulb and the hammock where a plump grub of a baby slept, stuffed into six layers of poly-knit. Mauricio, the lisping three-year-old who had outgrown the hammock, told us his name was Mowicio, and thus the adults addressed him, gravely: Mowicio. Supper was stale bread and weak, milky, boiling-hot coffee served in bowls the size of two hands. I got out my journal. Explained about how I’m always taking fichas, notes: ando fichando. They looked concerned. I thought, Dang, they’ve pegged me for an anthropologist. Writers are misunderstood. Outside, a familiar smell of roast corn, chile, woodsmoke. And bad drains: that rural Mexico thing of letting funky water run anywhere, mixed with garbage and rotting fruit. The crude outhouse had a hand-sawn seat, the hole chopped with an axe. Smell of excrement—pig, dog, human—mixed with smoke and clear, pine-scented wind. We slept in our clothes, on grass mats laid on the floor of the fifth grade classroom. It was cold. I wore everything I had. Even my monkey cage. Possibly I could have remembered that without writing it down. But life passes so quickly, I told the teachers, waving my journal. One forgets things. That’s why it’s so important to go along taking fichas. They looked appalled. But why should they believe somebody named Head Louse? The fifth graders, like preteens anywhere, hid their writing with their bodies. They had been seated boy-girl-boy-girl; they stayed calmer that way, said their teacher, because at this age, in this culture, boys and girls don’t talk to each other. They asked my name. “Elizabeth,” I said. I explained about my fichas. They looked uneasy. Horrified, in fact. Betsy James is the author-illustrator of sixteen books and many stories for adults, teens, and children. 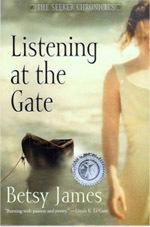 Her latest novel, Listening at the Gate, is a Tiptree Award Honor Book and a New York Times Best Book for the Teen Age. Forthcoming: Roadsouls, her next fantasy, will be available in 2016 from Aqueduct Press. Visit her at BetsyJames.com and ListeningAtTheGate.com.